After a lovely 3 weeks in the UK, it was time to head back to France. 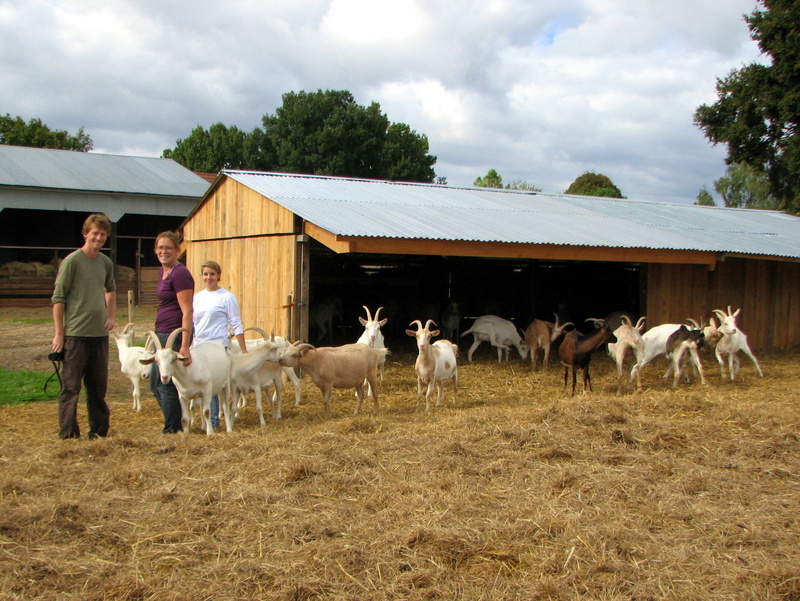 We took a quick flight to La Rochelle, rented a car and drove back to the farm. We needed to pick up our bikes, return Alex’s suitcase and spend one more day on the farm. We had missed the work on the farm while we were gone. It was great to see all the goats, some of them seemed to remember us. The ladies were immediately affectionate, whereas it took a week before we received that kind of attention when we first arrived. We were surprised to see a noticeable difference in the size of the babies. Isatis, our favorite little one, was no longer able to escape by squeezing through the slate of the fence. We were able to spend a lot of time catching up with Alex and Mathilde, an intern, and we all worked together very well. It was nice that everyone knew the routine, so we could get the work done quickly and focus on having fun with the goats. I also had the opportunity to watch the “marriage” of several ladies with two of the billies. 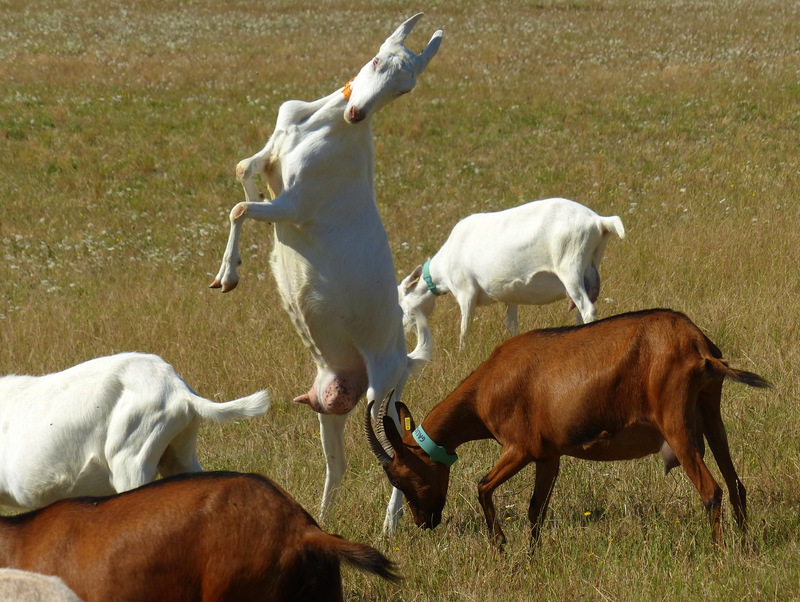 At one point, Alex had explained the mating rituals of goats to Chandler and I, but the act sounded strange enough that I needed to see it for myself. To attract the females, a male will urinate on himself, slap the female’s belly with his hoof while simultaneously tickling her ear with his tongue. Not the most romantic courtship, but it worked. We also made sure to eat enough cheese to last us a long time. 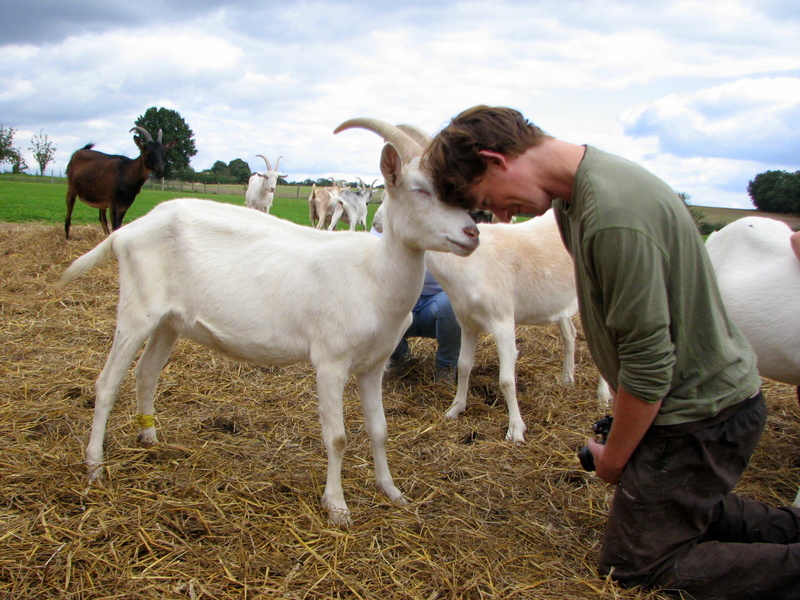 Alex makes the BEST organic goat cheese! I would highly recommend that if you are in her area, check out her farm, La Ferme des Croq’Épines, and get some of her cheese. Being on the farm was a great choice and a highlight of the trip. Feeding, milking, herding and making cheese were just the basic jobs that needed to be done every day to keep things moving. As with most farms, there was a long list of projects that needed attention. Once we had the basics down, we were able to tackle some of the project work each afternoon. Once she found out that we enjoy building, she put us to good use. We helped her friend add an addition to on of the barns for the young. 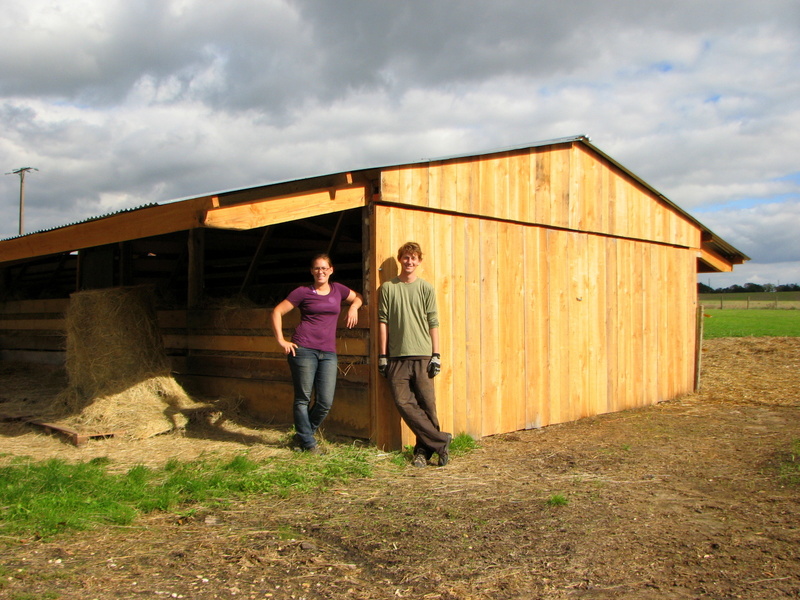 We also re-roofed the horse’s shelter and built her a little wood shed. We also experienced death. Two goats died while we were there, both from sickness. One of the billies died from worms and diarrhea, so we got to help vaccinate all the remaining billies. This entailed Chandler putting the billies in a modified headlock, while I filled syringes and Alex performed the shots. 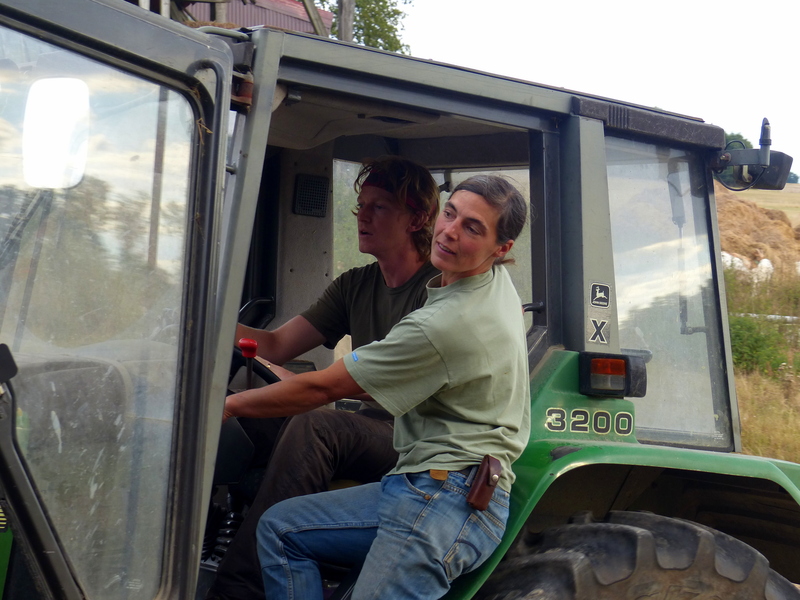 A big highlight for us was learning to drive the tractor. Alex had mentioned it casually after about a week, but we didn’t take her up on the offer for another week. Basically, we just moved rotten hay bales to the compost. Not that exciting, but we thought it was cool. The tractor was pretty easy to learn, the joystick moves one way to raise and lower the bucket and moves another way to open and close it. 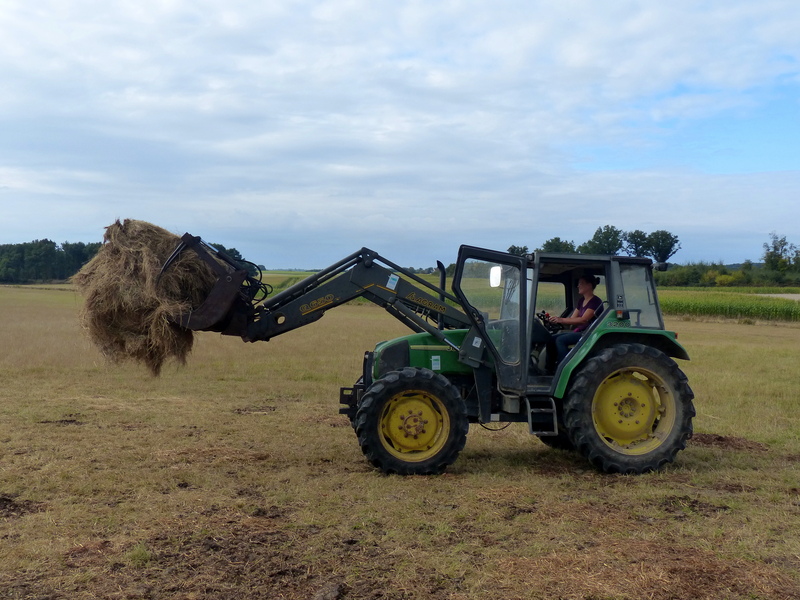 Balance was important, because the tractor could tip over if too heavily loaded and the bucket too high. 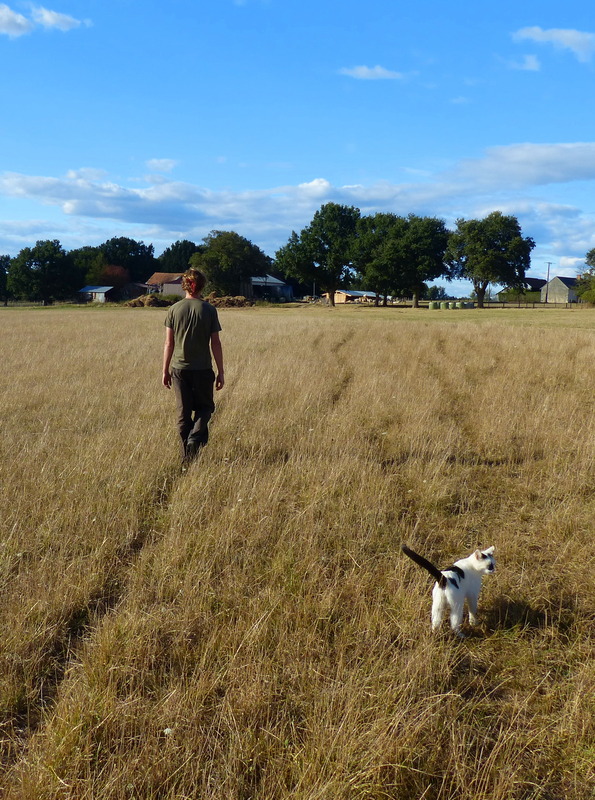 Our month on the farm was a really wonderful experience. 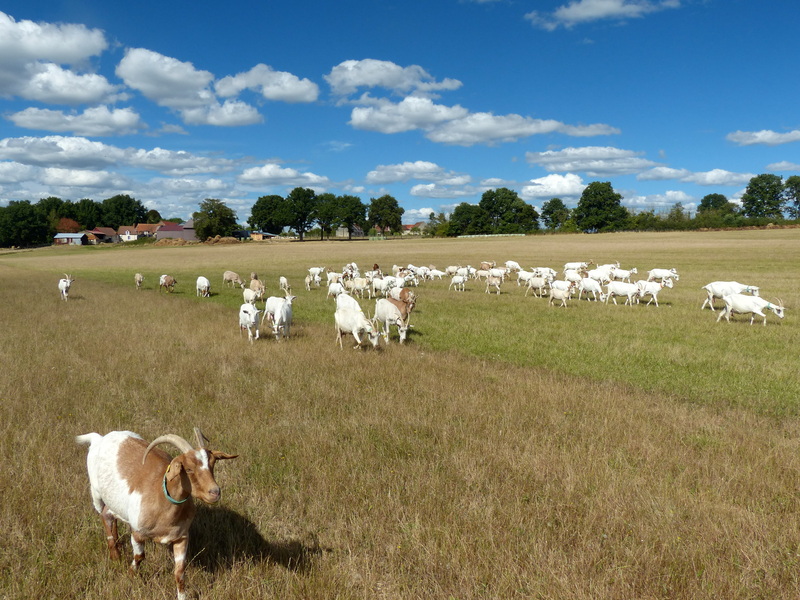 We learned a lot about running and maintaining a goat farm. Now, instead of talking about owning animals, we have a decent idea of what that would actually entail. There were lots of goats, but we spent most of our time with the milkers and their babies. Alex has 50 active milkers, 19 nursing mamas and a handful of 5 month olds that all live together in the main barn. Normally, mothers and babies are separated at birth, but Alex doesn’t need the extra milk, so for now, she lets the babies stay with their mamas. 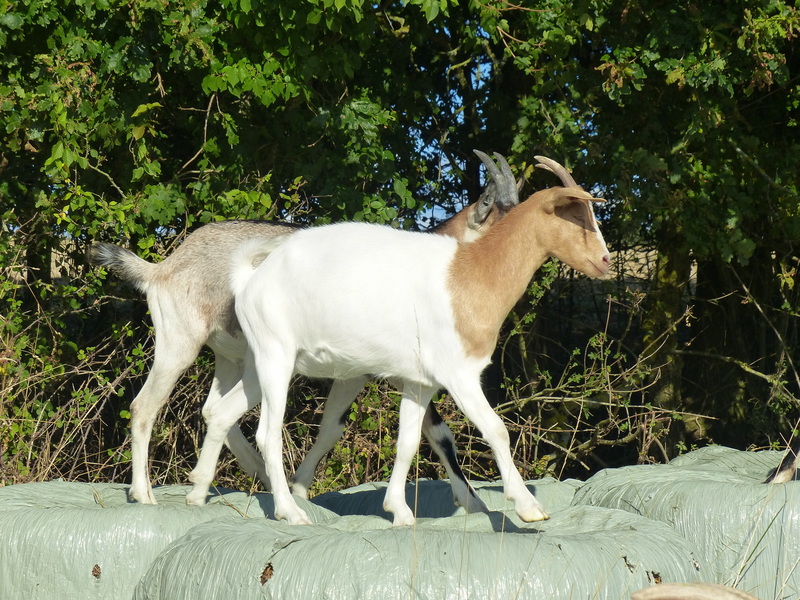 When we first started work on the farm, we could barely tell one white goat from another white goat, however it quickly became obvious that each goat had her own personality. Some of the goats were very slow to warm up to us, others were mischievous and caused trouble while others would have made perfect cuddly pets. 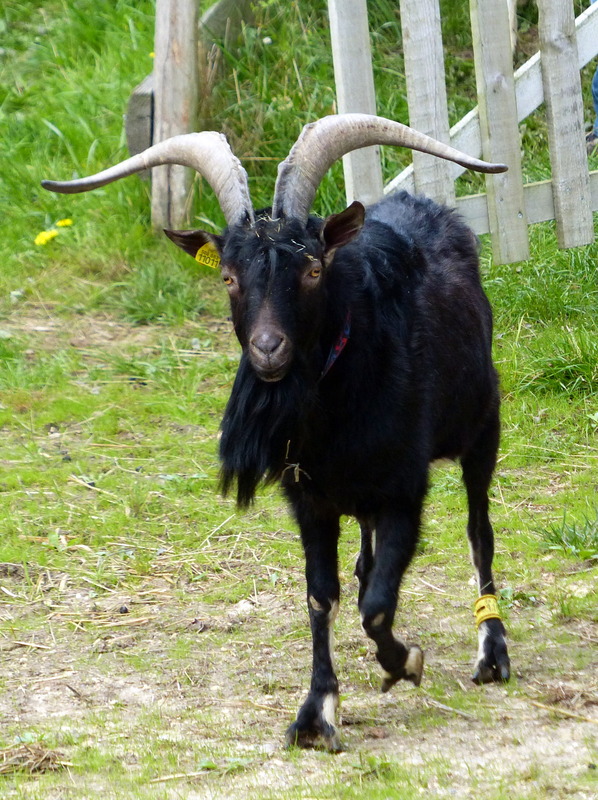 Alex has also given each goat a different name with each generation starting with a different letter. By the end we knew maybe a third of them by name, but a few we ended up giving nicknames that stuck for us, like Big Mama. 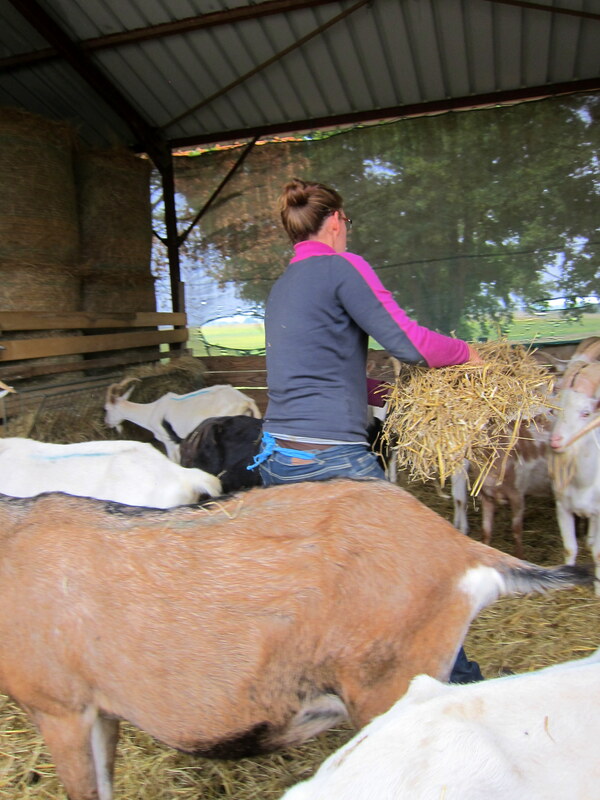 Our time with the goats began with milking and feeding. Each milker received a ration of alfalfa pellets and cereals while we attached the milking machine. There were four goats being milked at a time. 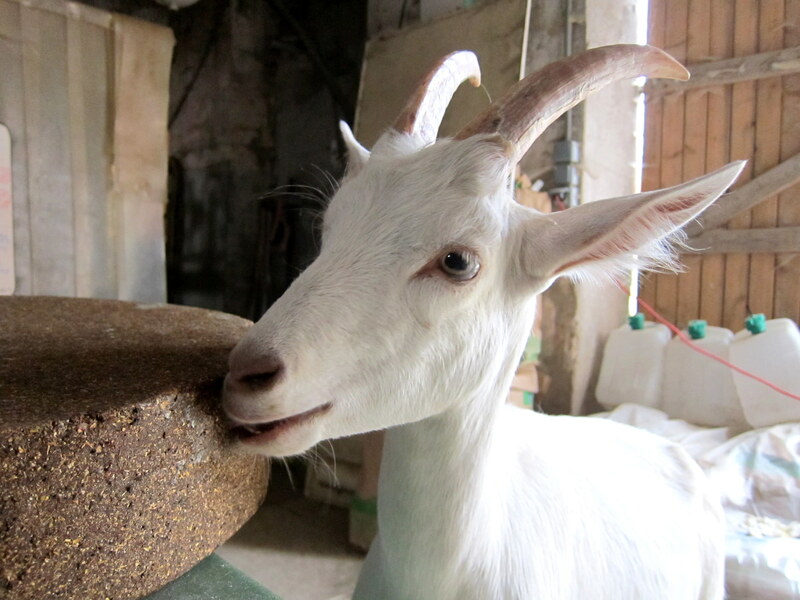 Some goats gave a lot of milk, over a liter or so, others gave barely a cup full. After lunch, someone played shepherd and spent several hours in the pasture while the ladies grazed. This is when personalities really came out. A few ladies were always leaders of the pack, while a few like Big Mama hung back and just went along with everything. A few were constantly fighting and butting heads with each other. A small group of them were the rebellious/ mischievous ones. They seemed to thrive on the attention and would bolt for the neighbor’s fields even though the fields they were supposed to be in had a lot more grass for them to eat. We spent a lot of time heading off the leaders, and keeping the rest of the herd from bolting after the naughty ones. Other times they were more fun to be in the field with, like when they would follow me around looking for affection or because I would hold down branches so they could eat more leaves. I can honestly say that we really loved the goats, almost like pets. In some ways they were like mellow dogs, who didn’t really listen very well. 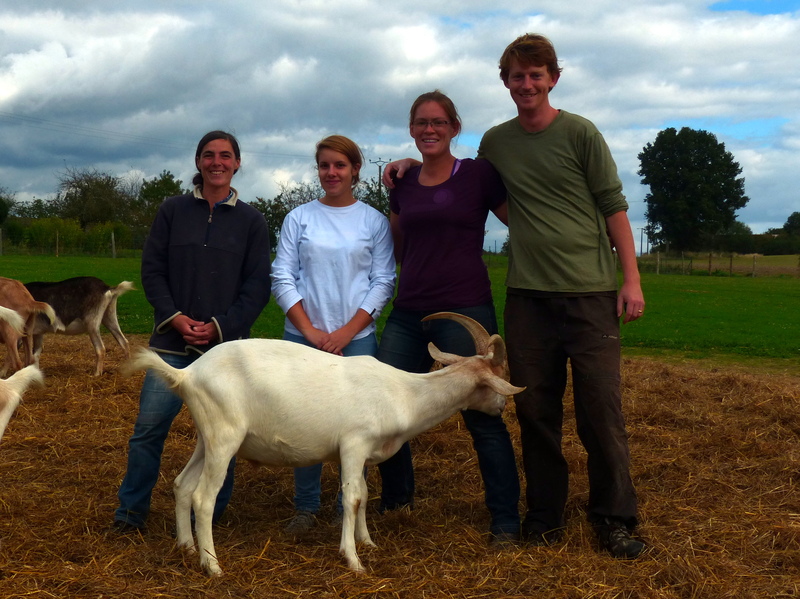 One of the fringe benefits of working on an organic goat cheese farm was obviously an unlimited supply of goat cheese. Alex makes some of the best cheese I have ever had in my life. There is a lot of diversity in the flavors, ranging from young, rich and creamy to aged, strong, spicy and super moldy! The cheese has a very distinct flavor, different from a cooked cheese like mozzarella or cheddar. 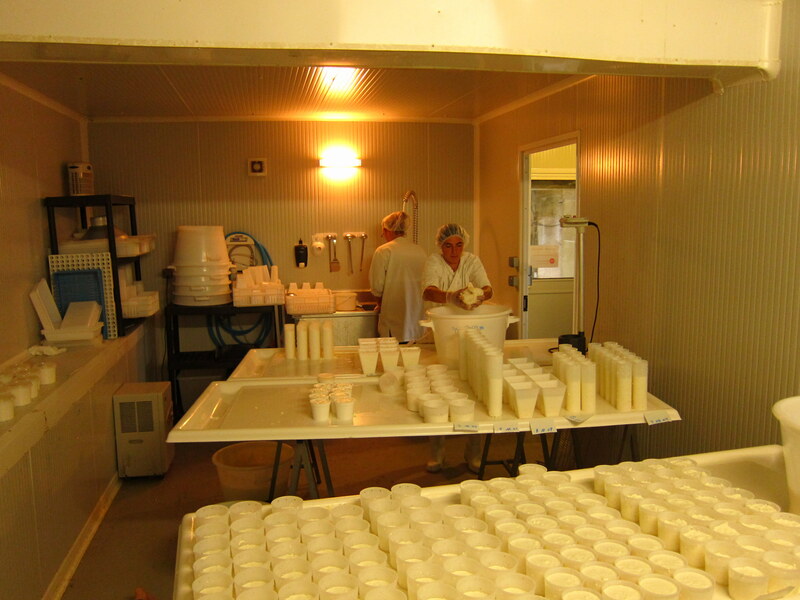 The process of making cheese began once we were done milking the ladies. 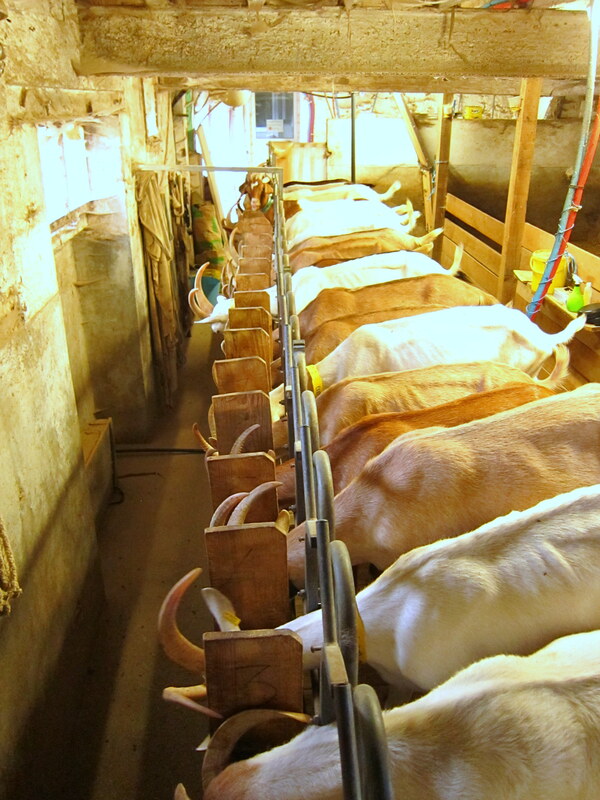 The raw milk was brought into the fromagerie and left to settle while we washed our hands and donned our lab coats, rubber boots and hairnets. Once the milk was settled and the quantity measured, it was time to be filtered. 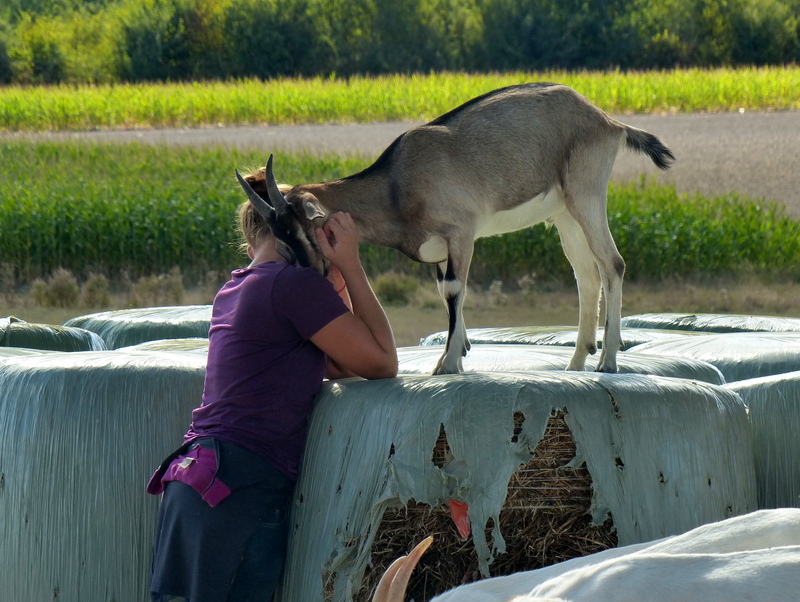 The filtration was required to catch any hair, dirt or flies that could be in the milk, mainly debris from the field that were stuck on the goat’s teats. The fresh milk was poured into a large funnel with three metal filters. Between each metal filter was a paper filter to ensure everything was caught. The milk was left for a while so the froth would dissipate. Rennet was added to the filtered milk and allowed to sit for at least 12 hours. 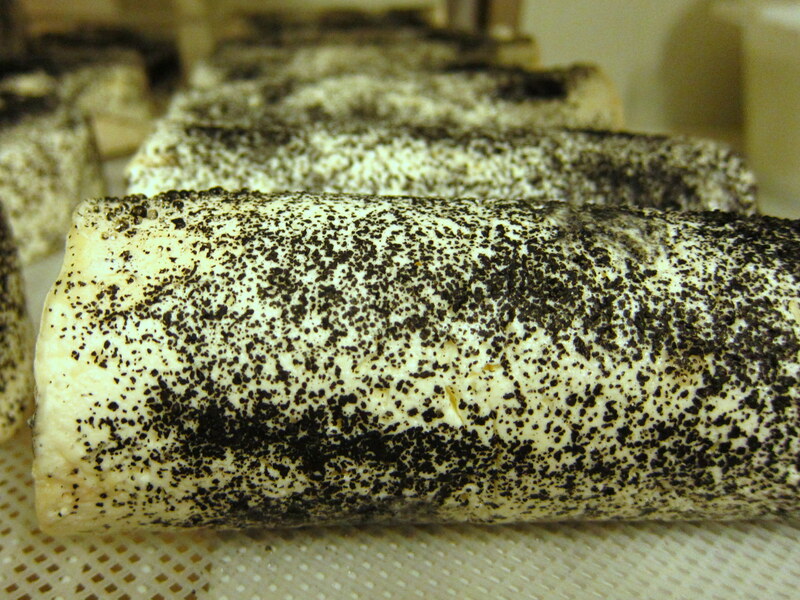 One of the nice things about Alex’s cheese was that she used vegan rennet derived from fungus. This process was distinct from other large scale processes where the milk is usually refrigerated and then processed in larger batches. Alex told us such large swings in temperature significantly affect the behavior of the living part of the milk and changed the resulting cheese flavors. The whey and the curd took about 24 hours to separate from each other. The whey was drained off and we scooped the curd into one of three forms: buche (log shaped), crottin (hockey puck sized) or the pyramid (actually a truncated pyramid shape which purportedly was in homage to Napoleon Bonaparte’s successful military campaigns in northern Africa) . 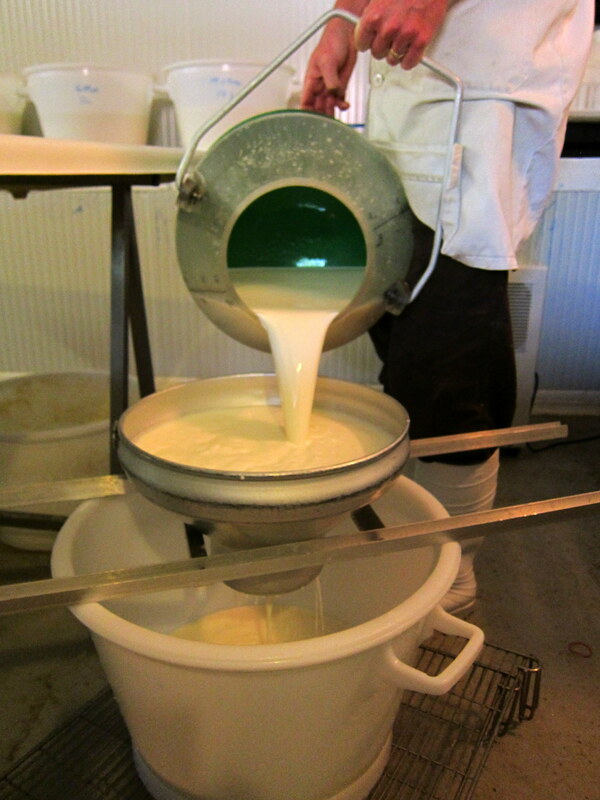 The curd would remain in the form for a few days while all excess whey was pressed out by gravity. 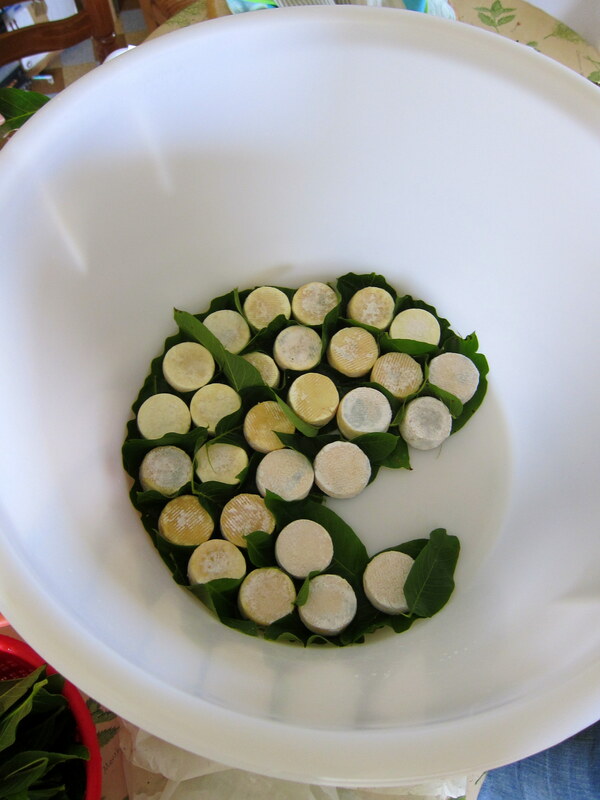 Once ready, the cheese was removed from the form, salted for flavor and allowed to dry in front of a fan for two days. The buche and pyramid forms were also sprinkled with ash from a specific tree. Unfortunately, Alex didn’t know the name is English and we couldn’t remember the French name. While drying out in front of the fan, mold began to develop. 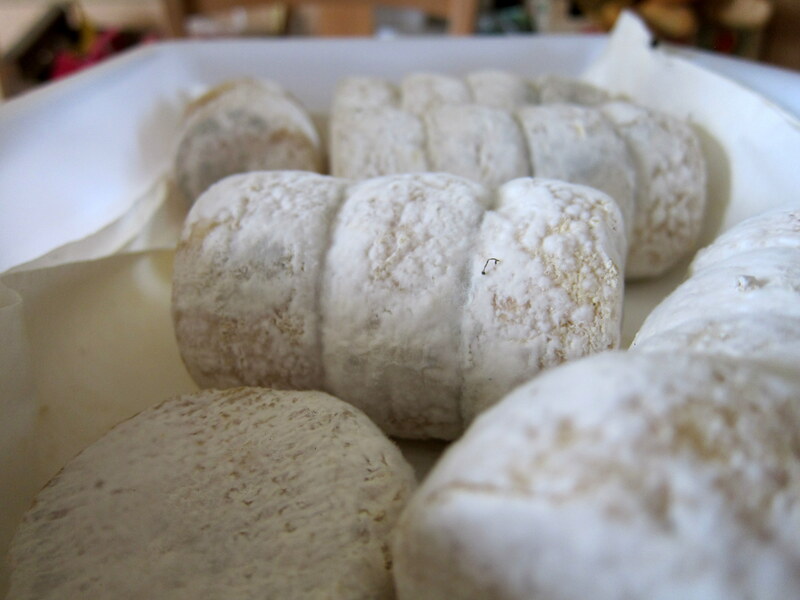 While young cheese was delicious, the petit bleu, the cheese covered in blue mold was the best. The cheese was eventually transferred to a refrigerator, where it would stay until purchased. Alex sold her cheese at several farmer’s markets or to people who stopped by the farm. As stated before, Alex makes the best cheese and normally doesn’t stray from her usual methods. However, while we were there, she decided to try something new and we got to help. 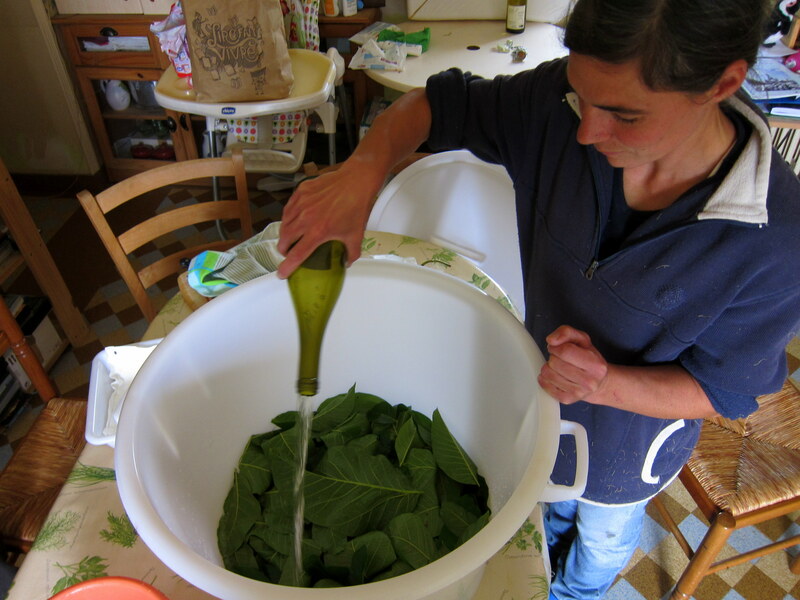 She gathered walnut leaves from the trees in her yard and wrapped some of the younger, slightly moldy crottins in the leaves. Then she poured two bottles of local organic 2 year old sauvignon blanc over the cheeses. The whole thing soaked overnight. The cheese was allowed to dry out in the fridge for a few days before we tried it. The wine soaked cheese gave off the delicate floral scents from the wine and the combination of the goat cheese flavor and the volatile notes from the alcohol made it especially delicious. 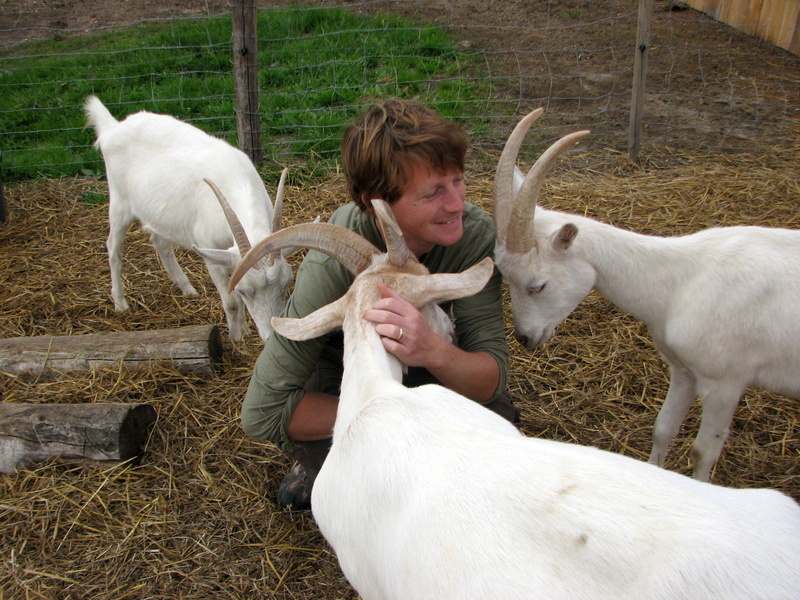 Alex’s goat farm is about 20 hectares (about 50 acres) of organic pasture and farm buildings. 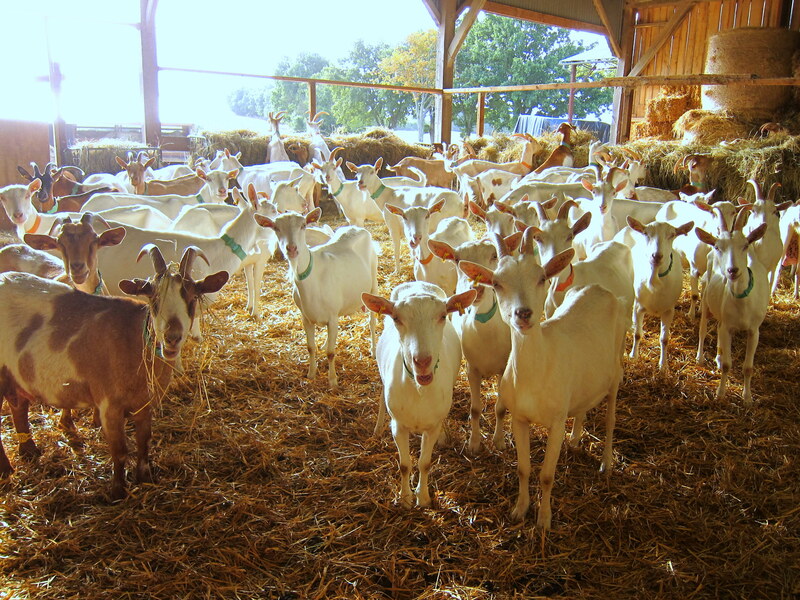 She has about 200 goats, of which about 50 are active milkers. The other residents include a flock of 11 sheep, a horse, 7 cats, a handful of chickens and two dogs, Pateau and Etincelle. It is a hectic place with work to be done seemingly at all times! Our first few days started around 7:30am and ended close to 23:00, but once we got the hang of things we started later and ended earlier. We were always offered time to relax after lunch, but mostly just wanted to be useful. Each night we fell asleep quickly and feeling like we had done a solid day’s work. Our morning started as usual, coffee and breakfast and breaking down camp. We tried to go straight through the park we were in, but ended on a private road and in someone’s backyard. 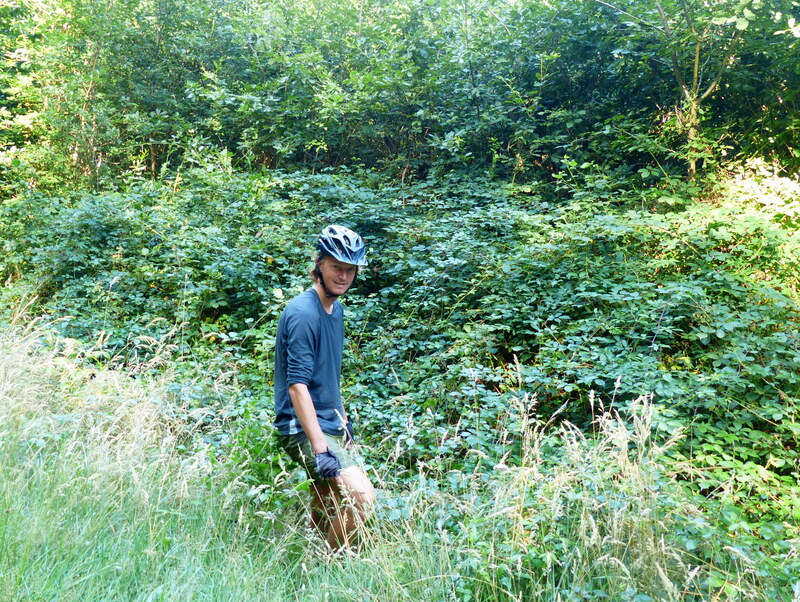 Turning around is normally quite annoying, but we found some blackberry bushes. After a quick snack we made a beeline for the main road. We pedaled quickly through Nouans-les-Fontaines and onto the road to find the farm. We passed a few other farms, wondering which one was ours. Finally, we reached a sign advertizing fromage de chèvre and knew we found the right place. 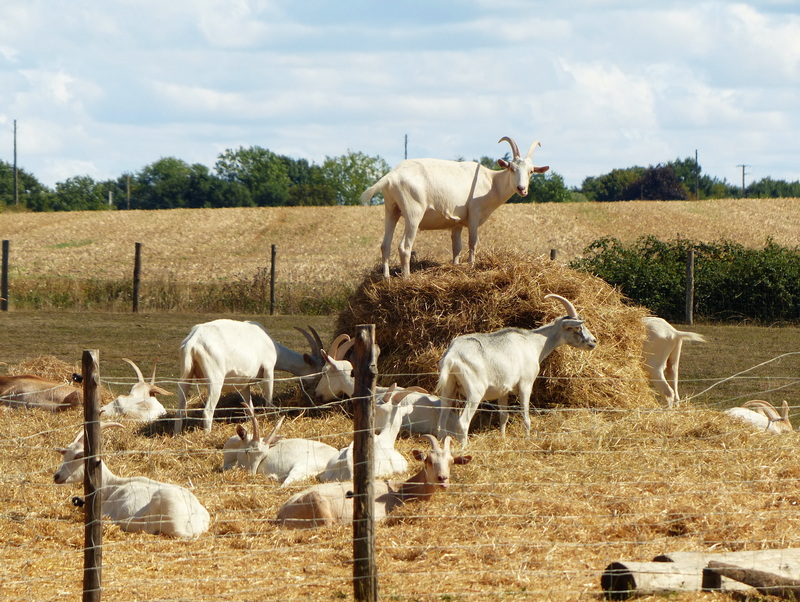 There wasn’t anyone around but a few goats on top of a huge hay bale. We found the house and Alex came out to greet us and show us our room. We put our bikes away, changed clothes and immediately got to work. The farm Chandler and I chose was an organic goat cheese farm. Our first afternoon was spent in a flurry of activity which left us exhausted. We passed out that night knowing we had made the right decision.